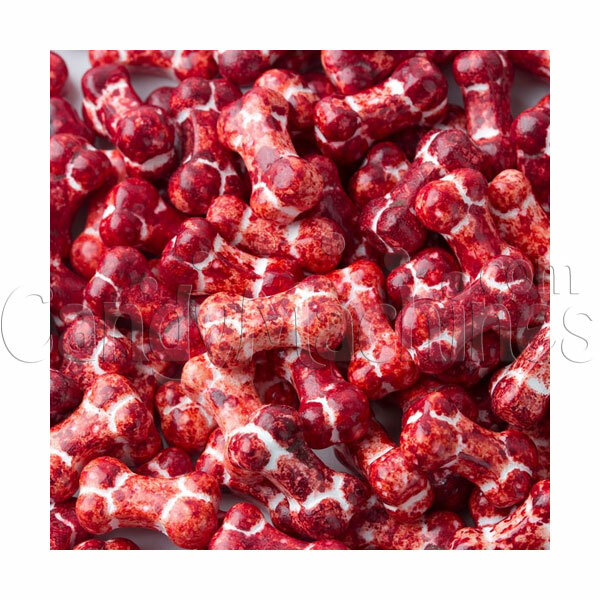 These scary candy bones are perfect for keeping out all year round and during the Fall Halloween season. The coating has a nicely finished sheen with a little bit of splattered red giving them the appearance of blood. They become powdery when you crunch into them. They are shaped to resemble human bones. Each bone is about 3/4 inch in length. These scary tart candies are sure to be an attraction in any home or office.You can choose between a 1 pound bag or a 2 pound bag of candy, and shipping on orders up to 2 pounds is only $5.00! For more great treats, be sure to see our full selection of candy by the pound. Weight: Your choice of 1 lb. or 2 lbs. Made by Oak Leaf, this bulk vending candy is OU Kosher Certified. Candy is best stored in a cool, dry, low humidity location. Their shelf life can be up to 18 months if not exposed to extreme hot or cold temperatures.